Hyde Park is a famous park in Central London. It is the largest of four Royal Parks that form a chain. The park was established by Henry VIII in 1536 when he took the land from Westminster Abbey and used it as a hunting ground. It opened to the public in 1637 and quickly became popular, particularly for May Day parades. Free speech and demonstrations have been a key feature of Hyde Park since the 19th century. In the late 20th century, the park became known for holding large-scale free rock music concerts, featuring groups such as Pink Floyd, The Rolling Stones and Queen. There are hotels and there are some famous ones ! ~ Mandarin Oriental Hotel Group is an international hotel investment and management group with luxury hotels, resorts and residences in Asia, Europe and the Americas. Overlooking London’s Hyde Park on one side and Knightsbridge on the other, the hotel was originally built in 1889 as an exclusive ‘Gentleman’s Club’. The project, originally known as Hyde Park Court, was announced in Aug 1887 but was delayed by endless planning disagreements, the most notable dispute being the proposed height of the development, which was to be the tallest building in London. The palatial interior decoration and the use of marbles and gilding were years ahead of the best London hotels of the time. In 1899, a fire struck the property, damaging the top three floors of the Knightsbridge wing and destroying part of the roof, including the central iron and glass turret. All residents made a successful escape, despite the fire brigade’s ladders only reaching halfway up the building. After the renovations, the building was reopened in 1902 as the Hyde Park Hotel, London’s newest and grandest hotel. The ceilings and marble floors had survived ! ~ now the hotel is again in news as there was another major fire breaking out today – 6th June 2018. Robbie Williams was among hundreds of guests caught up in a fire at the luxury £600-a-night Mandarin Oriental hotel in central London this afternoon - just weeks after it underwent a £185million refurbishment. 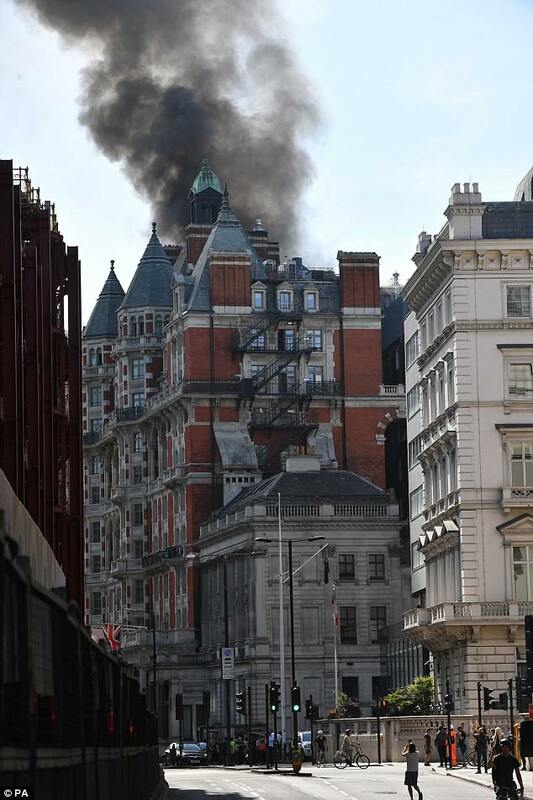 Thick black smoke was seen billowing across the capital's skyline from the 12-storey hotel in William Street, Knightsbridge, where a presidential suite costs £6,000-a-night. More than 100 firefighters and 20 fire engines were dispatched to the fiery scene and police cordoned off the surrounding roads as passers-by gawked at the smoke. 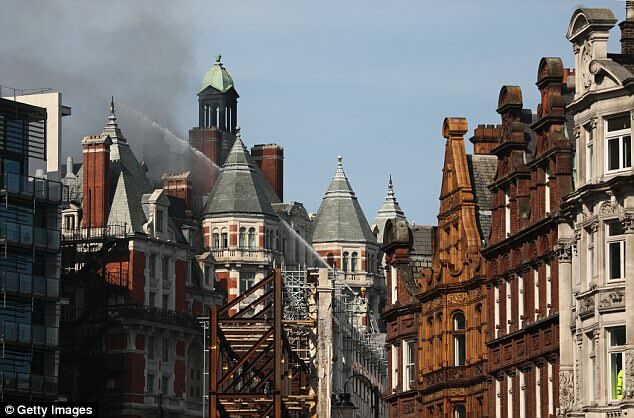 MailOnline reports that the hotel and nearby buildings were evacuated and there are no reports of any injuries. The cause of the fire is yet to be established. The Hong Kong-owned hotel recently finished the most extensive and costly refurbishment in its 115-year history, with rooms only re-opening to the public last Tuesday. Williams, 44, was staying at the hotel ahead of charity football match Soccer Aid 2018, which kicks off in Manchester on Sunday when he got caught up in the blaze. The area surrounding the Mandarin Oriental hotel was completely closed off as emergency services raced to the scene. The London Fire Brigade confirmed no one was trapped or injured in the fire. A fire brigade spokesman added: 'The Brigade's 999 control officers [took] more than 35 calls to the fire, which [produced] a lot of smoke. All the guests escaped safely and Mandarin Oriental staff were pictured in Hyde Park waiting nervously outside as the flames continued. They were given bottles of water when they were evacuated. It was reported that builders on the roof had been cutting materials and doing other work during the day. 'The fire brigade cordoned off the street and the customers from the surrounding shops too were evacuated. Reports added that 20 fire engines scrambled to the scene as there were ambulances and even helicopters overhead. Grenfell disaster is fresh in the minds of the people, and thankfully, this was not a disaster, though it billowed lots of smoke.